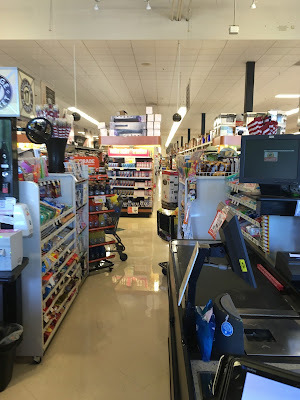 Village Super Market is one of the largest Wakefern members, with 29 stores in three states. It's also the only Wakefern member that publicly trades its stock. Accordingly, the stores often feel very corporate. In the time that I've been interested in supermarkets (the last 10 years or so), Village has almost always been among the worst ShopRite operators around in my opinion. However, very recently, Village has really been stepping up its operations: cleaning up stores, improving management, and diversifying its selections. That's not to say Village is perfect -- far from it -- but it's nice to see improvement. This store, in Garwood, NJ, is a perfect example. Opened in 2001 but planned as early as 1995, the Garwood ShopRite was a virtual twin to the Elizabeth, NJ location. However, Garwood is a far more upscale town than nearby Elizabeth and the competition is a Pathmark-turned-failed Food Emporium and a Kings. 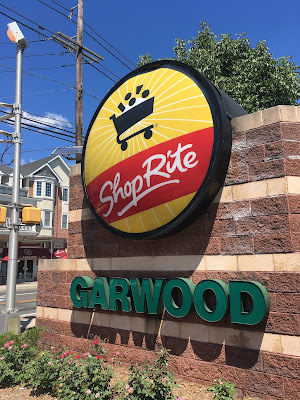 Interesting that the storefront says "Garwood ShopRite" and this monument sign says "ShopRite Garwood". Most stores just say "ShopRite", so I'm not sure what the story is here. The layout is pretty simple. The store's side faces the street, and the front faces the parking lot. 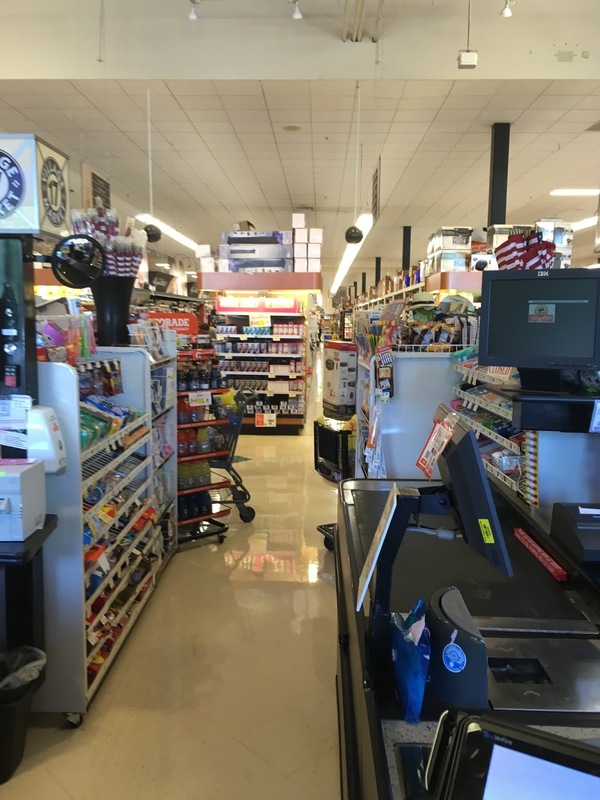 It's deeper than it is wide, so the first aisle is produce and lining the right-side wall, bakery, seafood, and prepared foods with deli and meat at the back of the grand aisle. Meats run along the back wall and dairy is in the last aisle. The photos here were from my visit in August of 2017. Looking towards the entrance. Bakery is immediately inside the entrance. All the produce cases to the left here are new, and the walls are newly painted. The store looks very dark in these pictures, but it's actually very bright and open in person. I think that's because of the windows behind the service counters to the left. Standard seafood counter. The decor features cartoony pictures of small-town businesses: bakery, butcher, farm, etc., which ties into the Village Super Market name. Nice floral department neat the back. Elizabeth's has been significantly downsized. Prepared foods looking back towards deli. Bistro Street, the forerunner of Village Food Garden, is the prepared foods department. Village Food Garden is the very upscale food-court brand for Village, but some stores also have Bistro Streets and others have ShopRite Kitchens, a cooperative-wide brand. Looking back towards the entrance. Perhaps the smallest food court I've ever seen in a supermarket. Obviously the store takes pride in it though! This picture gives a good overview of the grand aisle and you can see how spacious it is. I wish they'd kept the open ceiling over the whole store, but it's fine. This also gives you an idea of how bright the store actually is. Meat is next to the deli along the back wall. The walls were recently repainted, as they used to be a kind of dingy yellowish beige. The aisle markers are also new here. The grocery aisles feel a lot like Elizabeth. Not much to say here. The aisles are divided by a center aisle because they are so long, just like Elizabeth. The ceiling is slightly higher above the center aisle. Meat and dairy along the back wall. What's cool about these refrigerator cases is, like the ones at the Airmont ShopRite, they're open cases with doors added. Everyone should be doing this! I do wish there was something on that blank wall to the right. Nice upgraded pharmacy with wood texture and gold lettering. Closed on Sunday afternoons. Nice but cluttered front-end with exposed ceiling. I'm not a fan of the suspended tile section over the checkouts because as usual, there are water stains and damaged tiles. I do think these huge circular light fixtures are pretty cool, though. They shine up onto the ceiling. In the alcove behind the pharmacy is where the store runs their ShopRite from Home service, which is online shopping. I do appreciate also that the floor has been refinished recently, although I don't love the vinyl tile. It's possible that the floor in the grand aisle has been replaced by now, as Village has been doing that in many of the stores. 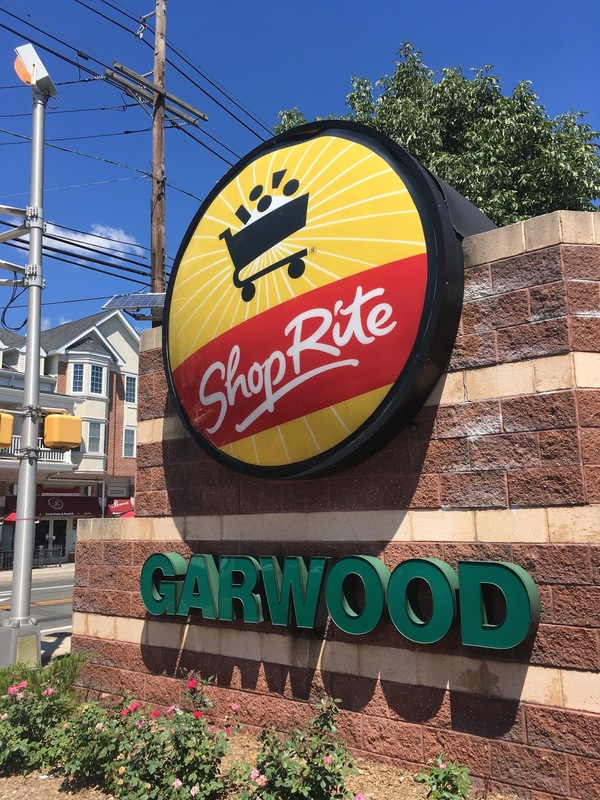 Garwood is a very nice store and I can say it's been seriously improved since even a few months ago, but the parking is in the bottom five worst stores I've ever been to. I actually used to go to this store frequently when I was little-- we lived in Westfield back then and this, along with the SR in Clark, was our grocery store of choice. It helped that my grandma knew one of the managers here, and for whatever reason, gave us the first Harry Potter movie on VHS (though we gave most of our tapes away years ago). Sadly, I don't remember much of what the store looked like, and it seems the flat-screen TV they used to have in the deli or thereabouts has been taken out; from what I recall, they displayed ads and stuff, with a news ticker sourced from Reuters along the bottom. We moved out near Hackettstown around 2004 (since the Westfield property taxes were insanely high), and nowadays we mostly patronize the SR in Mansfield (even despite its' crappy parking, though with a recent expansion and reset, my dad's gotten frustrated over not being able to find anything and he's pondered shopping at the Weis across the road instead). The nearest Village SR is down in Washington on Route 31; we've only gone there a couple times but it has this exact decor and it's HUGE (my dad doesn't like it because they split the aisles up to make you buy more stuff); the A&P down 31 kept trying to fight it but didn't succeeded and went down with the chain (and Acme didn't buy it, probably sensing futility; ironic, considering the old Washington Acme on Route 57 is still vacant, complete with old decor!). Awesome! By split aisles, do you mean split with a front part and a back part? Because Garwood is set up the same way, and so is Elizabeth. These stores are all deeper than they are wide, so it makes sense. I know someone who used to shop at the A&P and is not thrilled with the new ShopRite, which he says doesn't always carry the same selection of items that A&P did. Competing with ShopRite is always hard, but competing with ShopRite in a relatively sparsely populated area is near impossible. Gourmet Market of the Month!